Ollie Linsdell is all set for this years Isle of Man TT. Ollie will be competing in the superbike, superstock and senior TT races on a Honda Fireblade superstock bike sponsored by Steve Bond. Alongside this bike Ollie will be riding a Yamaha R6 supersport bike and a Suzuki SV650 mini-twin bike in the two supersport TT races and in the lightweight TT race as well. 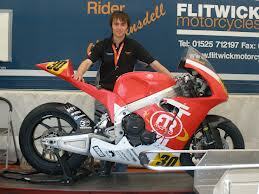 In 2012 at the TT Ollie took a 9th place finish in the lightweight TT race and was the highest placed Suzuki rider. Whilst in the supersport TT races Ollie achieved consistent and creditable results on the Flitwick motorcycles Yamaha R6 supersport bike. Alongside competing at the TT this year Ollie will also be competing in the newly formed classic TT races. Another of road racing’s rising talents Ollie Linsdell will be aiming for personal best results and improved lap times at this years Isle of Man TT.